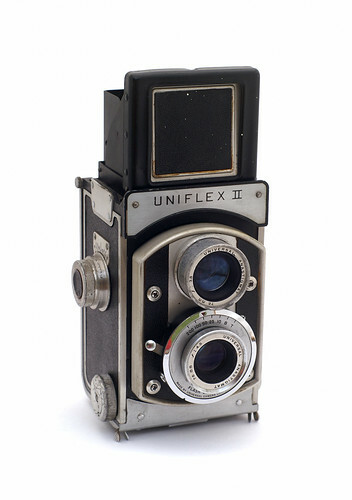 Manufactured in 1948 by the Universal (UniveX) Camera Corporation. Manufacturing cameras sucssfully to the masses in the 1930s and 1940s, the Universal Camera Corp. story was the “Enron” of it’s day (see link below). The Model II is a TLR for either 120 or 620 rollfilm. It had a Universal lens, f4.5 75mm lens. When you focus the front of the camera moves back and forth, but there are no bellow—a metal “shadowbox” keeps it light tight.